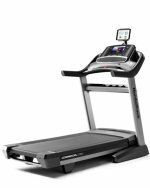 The Star Trac TR901 treadmill is the only residential designed model in the company’s focus of high end commercial quality treadmills. They don’t produce dozens of models, instead focusing on engineering about five models for athletic clubs, and this one is for home use. UPDATE: The Star Trac TR901 treadmill is no longer available. Check out the most popular models on sale here. To nit-pick, trainers may shrug at the 19"x53" deck which is a bit small for a running treadmill that costs over $3000, but the 1” thick deck is cushy. The Star Trac TR901’s deck is also reversible which technically speaking should give the belt a longer life span — up to 6000 miles. And that’s a good thing because the 2" rollers are also a bit small and can really raise some eyebrows with regards to a model selling at this price level. 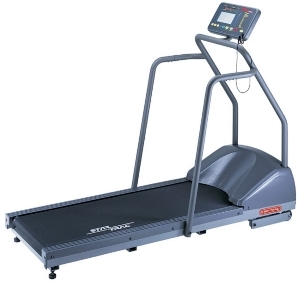 Commercial class treadmills use larger rollers (at least 2.5”) so that the belt can run with less tension, but home models need to cut costs somewhere. You can’t have everything. Owners of the Star Trac TR901 treadmill don’t find many faults with this model other than: do you really need 250 programs? Sure, variety is nice but do you really need all that when the most you’ll ever do is climb on, hit "manual", and plan to adjust the incline level according to what your thighs and calves tell you during your workout? Several leading fitness publications have named the Star Trac TR901 as a "Best Buy" for a couple of years. It’s got a smooth, quiet workout, extensive programming options and it’s rugged enough for daily use for the next 7 to 10 years. Experts can’t fault the Star Trac TR901 treadmill for overall quality, but note they do point out that it has had an unusual price hike over the last few years but with no important upgrades on features. That’s a shame because while it’s definitely a good buy at $2600, the treadmill is considered overpriced at the MSRP of $3300.